159 post offices across 25 counties are set to close. 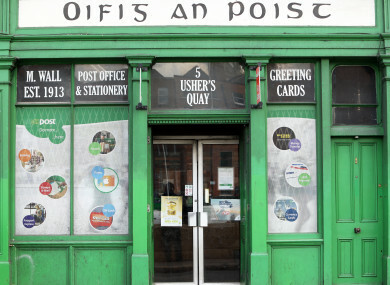 A post office on Ushers Quay, Dublin city. No post offices in Dublin are set to close. AN POST HAS announced that 159 post offices across 25 counties are set to close. The company said all of the post offices in question are in locations where there are fewer than 500 people living and that 100 of them are in remote areas with fewer than 50 occupied dwellings. Post office closures have been debated a lot in recent years, with several communities staging protests. The offices are an important resource for many people, particularly older people in rural areas, but are used less frequently than they once were. Let us know: How often do you use the post office? Email “Poll: How often do you use the post office? ”. Feedback on “Poll: How often do you use the post office? ”.